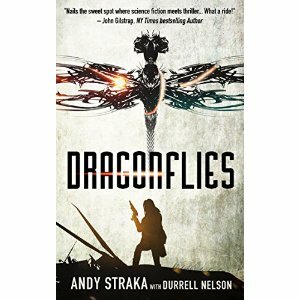 "Dragonflies" by Andy Straka presents a world in the near future where drone technology has evolved without the necessary social rules to guide its usage. The book begins with a military operation going horribly wrong because of faulty intelligence. The two main characters, helicopter pilot Raina Sanchez and soldier Tye Palmer, meet here as Tye rescues Raina from a crashed helicopter. Fast forward, and the two characters are working together to stop a crooked politician. Interestingly, while Tye does the ground work, it's Raina who is the more important person here as her flying experience lets her work with the minuscule drones. While this book is classified as science fiction, I wonder if it should just be considered a thriller because the technology here might already be available. I know it's more than a little disconcerting to think that our government might have to ability to send insect-sized drones around to spy on whatever they want, but considering how much miniaturization has occurred from the 1960s until today, this is a real possibility. In terms of strict writing, "Dragonflies" is clean - no grammatical errors, no misspellings, believable dialogue, and coherent paragraphs. The only problem I ran into was what I perceive as a problem with the plot. Spoiler Alert - Don't read on unless you don't mind learning a bit more. Tye and Raina learn that this politician has a hidden camera in his son's dorm room, or can assume this because said son date raped a woman and his father has the entire episode in a video. So it makes sense to assume the camera is still there, still working, and still broadcasting back to the father, right? Well, Tye confronts the son in his dorm room and doesn't follow the script laid out. A few minutes alter, all hell breaks loose as the father's men try to interfere, a key event to what follows. As Tye walks into the room, I sat here thinking, "What are you doing? You're going to tip off the man that you're not really working for him!" When the confrontation failed, I felt justified in my concerns, and I also felt that someone who is an intelligent as Tye would not have made such a mistake. It was a big enough discrepancy from Tye's normal behavior that I had trouble getting back into the story. Overall, if you like thrillers and can overlook some plot devices put in to move things along, you will like "Dragonflies". Disclaimer: I received a copy of this book from the publisher via NetGalley in exchange for an honest review.